nif-ty; adjective (ti-er, ti-est) informal, fashionable, stylish: a nifty quilt! While on retreat over the weekend, I made this "Water Wheel" quilt using vintage fabrics. Many of you will recognize the gems you sent me! Each block is 8.5" finished. I used the Accuquilt Go! Baby with the "chisel" and 3" hst dies. Then I started this. I've had several large pieces of Hawaiian bark cloth sitting around for years. I decided to try them with some blacks. We'll see. While I was away, my husband got a new girlfriend! Oh no! For those who wanted to see the beloved pink commode, here you go! We have pink sinks and bathtub to match. Vintage 1963. By the way I like that cloth you dog is sleeping on and my mom has colored commodes and sinks to match at the house in Lamia which I have been spending plenty of time at these days since the house has been neglected for many years. .
Love the quilt, the pink toilet and the new girlfriend. She is pretty cute. Love the water wheel! Haven't tried an acuquilt yet - but I'm thinkin I ought to! And the new gf - sweet! 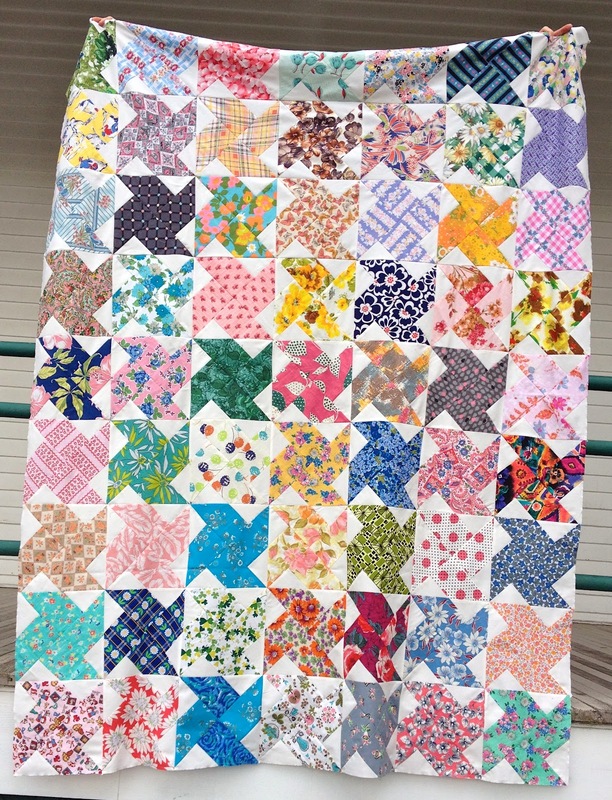 I like how you used vintage fabrics, and international fabric swap and your cutter to make a fabulous quilt. three great ideas! Oooh! I love that quilt top! It's the perfect block for those fabrics! Ha ha ha I could hear your voice when you wrote....."here you go". it maybe the first time I've seen a toilet show and tell :0). Yeah mine are jade green, harvest gold and grey! You rocked the water wheel....looking good! I hope you had a great time and have more pictures to share :0). Love the quilt! I just got done using some of my vintage cottons for the sashing in a Sunbonnet Sue quilt I put together for a friend. Those old prints are great! I had to laugh at the pink toilet! The current house I bought had a pink toilet, sink and tub too! The tile on the walls was pink and black and was installed in a vertical stripe pattern. The bathroom was in terrible condition - the sink did not work, the shower in the tub enclosure leaked, and the toilet bit the dust after I lived there a couple of years. So all the pink fixtures are gone except the tub is still sitting in the backyard. My house was build in the early 60's so I think our toilets were from the same family! Love it love it. What fun you must have had at your retreat. And looks as though Malti and hubby had fun as well. Love that classic pink pot. the quilt is just wonderful.! sorry--unwittingly commented on my son's identity! The quilt is just wonderful! I love everything in this post.I love your Water Wheel quilt!! How fun to spy some familiar fabrics! Malti looks right at home in your bed. Those lantern sheets are the coolest sheets!! Your pink toilet is so fun!!! I've lived in houses with old pink or green sinks that I've loved for their colour. the vintage fabric quilt looks great! the HST's are really cool! can't wait o see more of that! love that pic of Malti... Boo got a big kick out of that! And about your pink cammode... We had LIME GREEN! LOL! I would have never thought of a white background and you together! LOL! Your water wheel quilt looks so pretty. :)I just made myself vintage! pretty quilt. you really do love that GO cutter. poor Malti, is she gonna get tossed out into the cold now? she looks so sweet sleeping there. Not only is that shameless hussy sleeping in your bed, she's sleeping ON YOUR QUILT! Hi, Nifty. The waterwheel quilt (so cool) has caused me to reflect on the way tastes change over time. 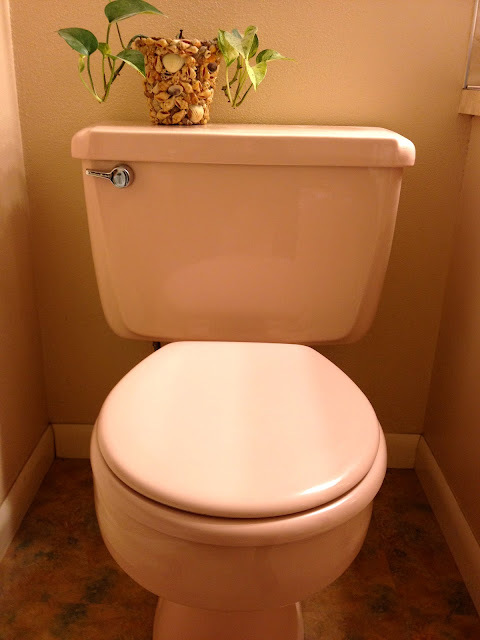 Take your pink commode for example--so sturdy-looking, a keeper! But I really LUV your experiment with the bark cloth and black--smashing! Been there, done that, with the pink '60's bathroom! Pink kitchens are coming back, I hear, so why not bathrooms too! The waterwheel quilt is great, btw! my aunt had a pink stovetop, oven & refrigerator. My Mum has a lilac loo from the 60's with lilac and white tiles on the floor. I think your mini quilt will suit very nicely in your pink room. What a pretty quilt, it is very eye-catching! Very charming, love it! Same thing at my folks including pink tiles! I've been making quilts since 2005, and am a big fan of Gwen Marston, Anna Williams, Denyse Schmidt, the Gee's Bend gals and old string quilts--the quirkier, the better. I love new fabrics, but my favorite source is the men's shirt rack at the local thrift shop. My quilts are on display!